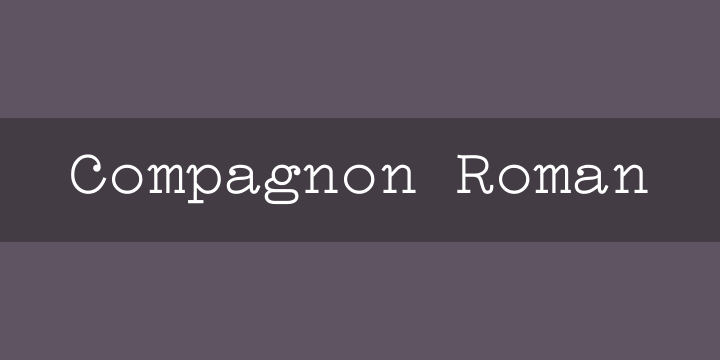 Compagnon is a typeface family composed of five distinctive styles. It finds its inspiration in the online archives of Typewriter Database specimens and combines different periods of the history of typewriter typefaces. Each weight is based on singular references relating to significant periods aiming to underline the evolution of typewriter characters as they are called. Compagnon Light and Roman have been drawn by Juliette Duhé and Léa Pradine; Compagnon Italic by Valentin Papon; Compagon Medium by Sébastien Riollier and Compagnon Script by Chloé Lozano. Meet Compagnon. You can use it, modify it and redesign it freely. Crédits: EESAB-Rennes, Typography creation studio, Master Graphic Design, 2018. Made in France, Made in Brittany.